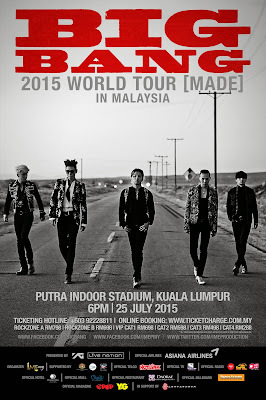 Kuala Lumpur (May 11, 2015) - IME Productions is proud to announce BIGBANG 2015 WORLD TOUR [MADE] IN MALAYSIA on July 25 (Saturday), 6pm at Putra Indoor Stadium, Bukit Jalil. This marks the group’s return to Malaysia since their previous tour here in 2012 which drew over 15,000 fans locally and internationally. 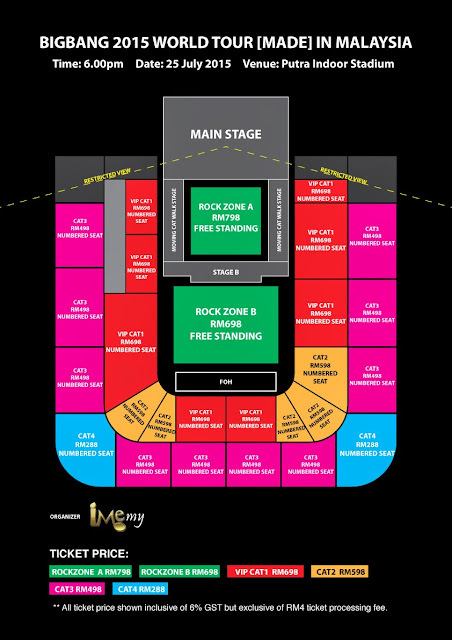 IME Productions, the lead promoter for BIGBANG 2015 WORLD TOUR [MADE] IN MALAYSIA will be commencing the ticket launch on May 17 (Sunday) at Quill City Mall’s ground floor main court from 11am to 5pm. Each person is entitled to purchase a maximum of 8 tickets on any ticket categories. Online sales will begin on the same day at 5pm via TicketCharge at www.ticketcharge.com.my. Rock Zone A ,B and VIP Cat 1 tickets holder are entitled for “Sound Check Party” lucky draw. +603-21666166 to purchase tickets. Outlet sales will also start on the same day at TicketCharge office, IME Productions office, Speedy Music Store, Rock Corner music store, Victoria Music Center and Neway Karaoke outlet.